1. SUN PHARMA LTD - Walk-In Interviews for QC / QA / Production / Technicians on 5th Apr' 2019 @ Panoli..
6. Zydus Cadila - Walk-In Interviews @ Hyderabad on 7th Apr' 2019..
7. Biocon Limited - Walk-In Interviews for Multiple Openings on 7th Apr' 2019..
8. Piramal Enterprises - Walk-In Interviews for Freshers & Experienced Candidates on 6th Apr' 2019..
11. Uni Medicolabs - Walk-In for Freshers & Experienced - QC & QA on 7th Apr' 2019..
12. INTAS PHARMA LTD - Walk-In Interviews on 6th Apr' 2019 @ Ahmedabad..
13. Aspiro Pharma Ltd - Walk-Ins for Multiple Openings - Production, QC, AR&D, Engineering on 5th Apr' 2019..
14. 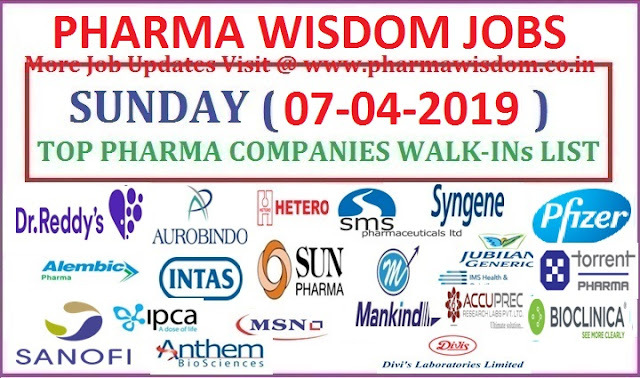 25+ Pharma Companies Mega Job Fest 2019 on 7th Apr' 2019..
15. Aurobindo Pharma Ltd - Walk-In Drive for QC, Production & Packing on 7th Apr' 2019..
16. MSN Laboratories - Walk-In Drive for QC Department on 5th Apr' 2019..
17. SMS Pharmaceuticals Ltd - Walk-In Drive for Production & QC on 8th Apr' 2019 @ Hyderabad..
18. Acme Generics - Walk-In Interviews for Production, Packing, QC, QA on 7th Apr' 2019..
19. Cadila Pharmaceuticals Ltd - Walk-In Interviews for Quality Control on 5th Apr' 2019 @ Ankleshwar..
20. Baxter Pharma - Walk-Ins for QC, IPQA / QMS / Production / Packing on 7th Apr' 2019 @ Indore ..
21. USV LIMITED - Walk-In Interviews for Production, Packing, Warehouse on 7th Apr' 2019..
22. Walk-In Interviews for Freshers & Experienced Production Associates on 9th Apr' 2019 @ Global Calcium Pvt. Ltd..
27. Walk-In Interviews for QA, RA, PPIC, Production, Warehouse, Maintenance on 14th Apr' 2019 @ Nanz Med Science Pharma Pvt. Ltd..
28. Walk-Ins for Fresher & Experienced M.Sc Chemistry - QC Chemist on 13th Apr' 2019 @ Global Calcium Pvt. Ltd..
29. Glenmark Life Sciences - Walk-In Interviews for Multiple Positions (25 Positions) on 7th Apr' 2019..